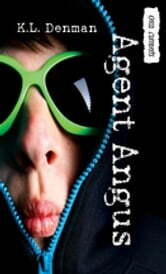 When a stink bomb at school provides Angus with a chance to talk to Ella Eckles, he claims to share her interest in reading facial expressions. He tells her he plans to become a crime-solving mentalist. When Ella’s treasured sketchbook is stolen, she asks Angus to find the thief. Angus knows he should confess that he’s not a mentalist, but the appeal of becoming Ella’s hero is far too strong. Angus decides to teach himself the arts of the mentalist and almost goes mental himself.